We just finished installing my new DIY interior wood shutters in my studio/office and I’m in love with how they’ve completely changed the room. I couldn’t wait to share this project, it’s simple but made a huge impact. This is one of those projects I’ve always wanted to do and had no place for them. A few months ago we decided to move the sofa bed out of my office to make my office just my office. That changed everything. 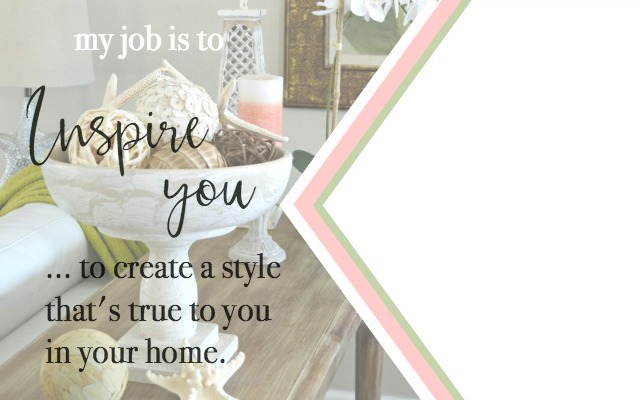 In about 5 minutes I started doing a makeover in my head and one of the first projects on my list was vintage style wood shutters. I grew up in the northeast where there are lots of old buildings. I’ve always appreciated old style windows, doors and hardware, pretty much anything that had character. Building my own set of old world interior wood shutters for my studio gave me a little bit of the vintage and old world charm that I love. 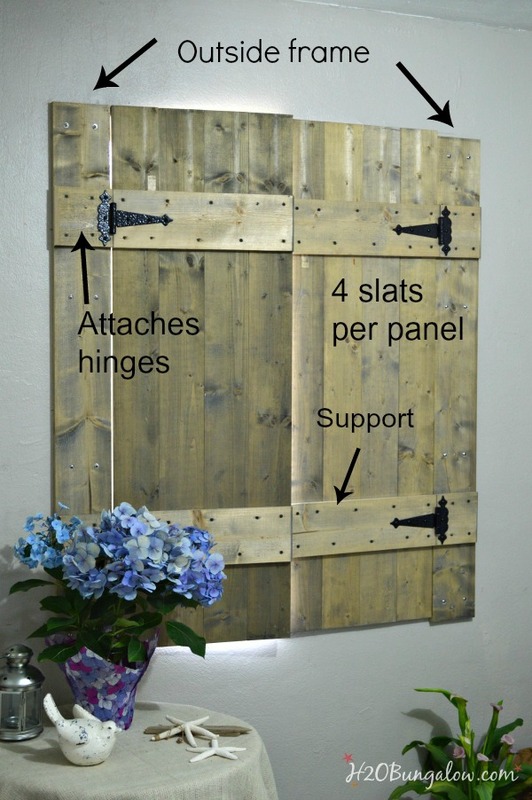 DIY interior wood shutter like mine are easily a weekend project. Since window sizes are different, I’ve decided to show you how I made my wood shutters rather than share plans for one size. 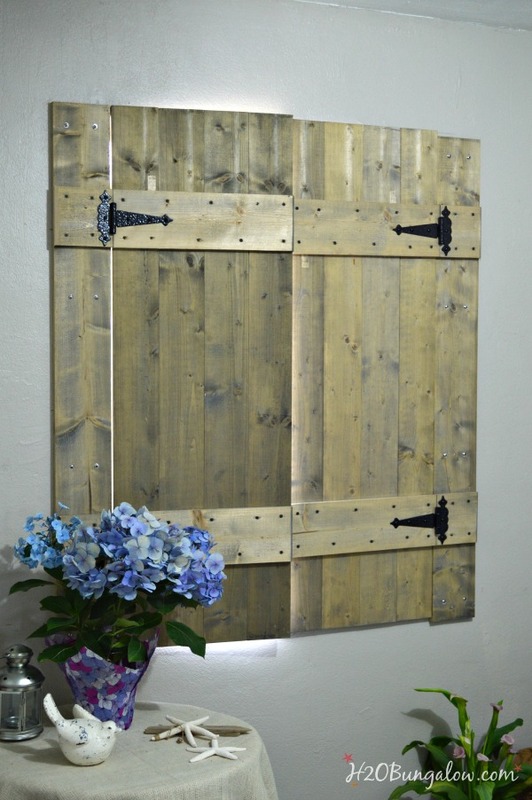 The length of my DIY interior wood shutters is 4 ” longer than the window, 2″ at each end. We used 1 x 6 pine boards for this project. 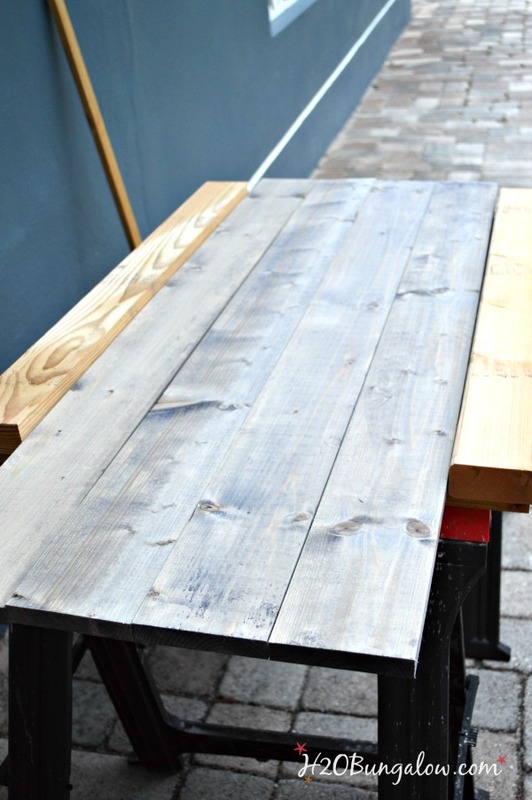 Be sure to pick through the wood and select straight boards for this project. 1. Outside frame – Install a 1 x 6 board on each side of the window the same length as the window panels to make the outside frame. We used 8 anchors on each panel. I have cement block walls 🙁 which required a masonry bit to drill the anchor holes. Most people will have drywall and wood studs. Be sure to choose the proper anchors for your wall and drill pilot holes on your frame boards. 2. Each panel was made with 4 boards. After doing the math for a 36″ window width, we ripped each 1×6 panel board down to 4 1/2″ wide. Next we squared one end by trimming a small amount off and then measured and cut the board to the length we needed. 3. Horizontal slat supports were made from 1 x 6 boards across the top and bottom of each panel. The boards were cut to length and mounted on the outside frame. Note the screw pattern we followed to attach the support to the boards on each panel. This was to prevent twisting and warping. You’ll notice in the pictures that these edges are angled. This is optional. 4. The hinges attach the side frame to the window panel. 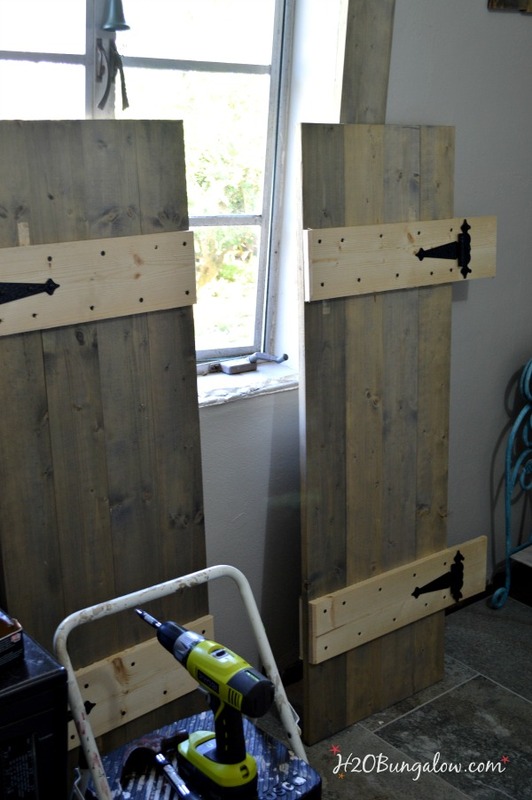 Here’s a few tips that I think are worth mentioning to make building the wood shutters easier. Since I didn’t own any clamps big enough for the width of the 4 boards, we built a jig to hold the wood slats of each panel together while we screwed the supports onto them. We wedged wood shims into one side at each end to press the panel slats tightly together. A word of advice, measure both the upper and lower part of your window width. Do one last check to be sure the wood panels fit and will close before installing them. My windows were built unevenly and the top is narrower than the bottom. We had an extra 1/4′ on the top of the panels and the shutters didn’t close well. I’ll have to trim a little off of the inside edge. It so much easier to do this before installing the panels! At the last minute I decided I really liked the decorative detail of the horizontal support slats across the top and bottom of each panel. We quickly made an extra set to mount on the inside of each shutter panel. 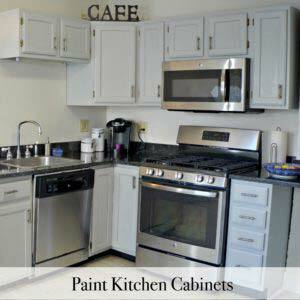 I stained them after my DIY interior wood shutters were installed. 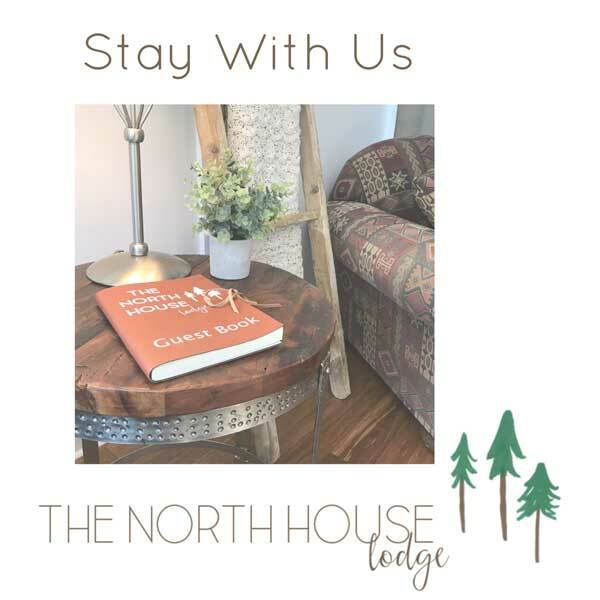 They are perfect for letting lots of natural light in when I need it to work, and shutting for privacy or blocking the hot summer sun out. 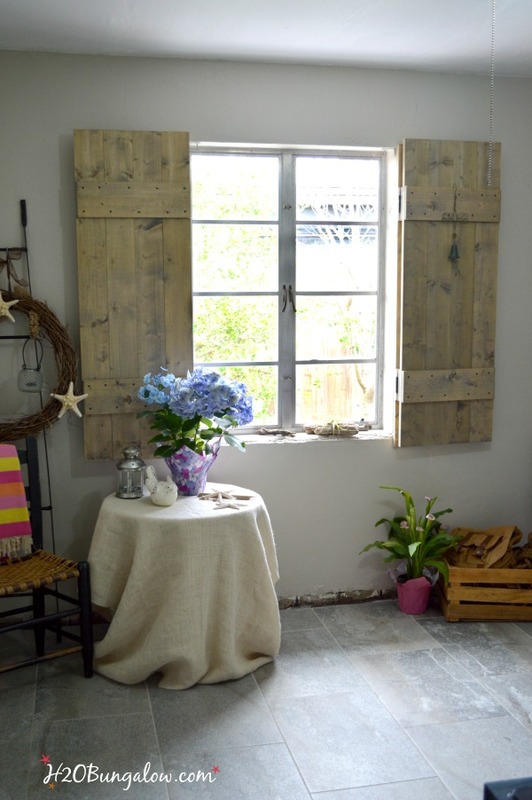 My new old world inspired vintage wood shutters add lots of character to my studio. I love the hinges and may find a decorative set to install on the inside of the shutter or some other hardware to jazz up the inside of the shutters since they will be open most of the time. 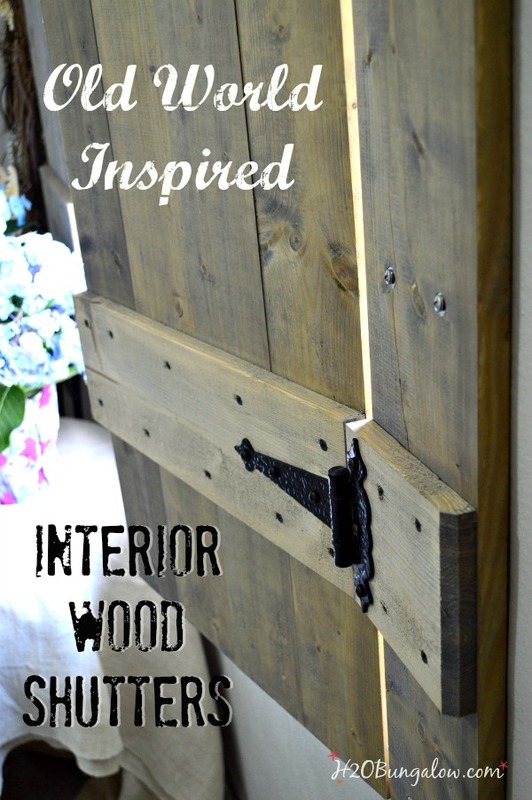 I’m over the moon excited to have a place that I could fit my DIY interior wood shutters in my home. They’ll work beautifully with my new plan for transforming my workspace into something special. I started out my office makeover with my upcycled metal bakers rack project last month. I have a few more to projects to finish before the big reveal. I’ve always been awful at keeping secrets and growing up hasn’t changed a thing! I can’t wait to share the rest of my office/studio makeover! Do you have a special decorative touch you’ve always wanted to add like my shutter project? Love these!! 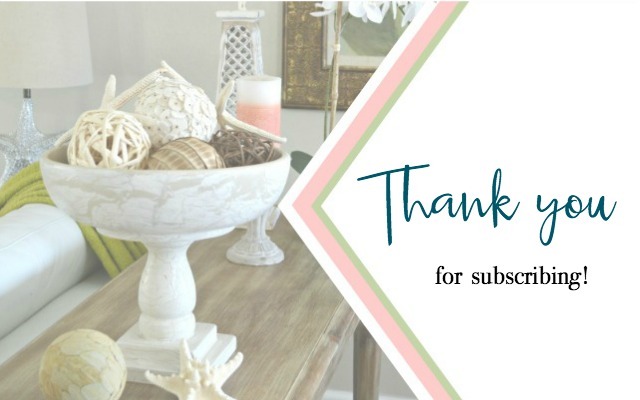 Thanks so much for sharing at The Living With Style Linky Party! Have a great day. You’re welcome Lory! It’s been fun sharing them and I hope I inspire others to make these as well. Love them! Thanks for sharing at #inspirationmonday! Pinning! These are so beautiful! Who needs curtains? And awesome that they keep the hot sun out. Audra, they keep the heat and sun out beautifully. Much more that I thought they would. Thanks so much for stopping by & your sweet comment today! Judy… Thanks so much for the good laugh you gave me & the reminder to fix it. 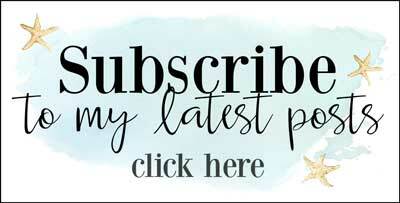 Will you come read the rest of my blog and send me a note when you find more? Seriously, thanks:) I’ve been copying and pasting the lower section of my posts for a long time. Sometimes I change things up a bit. I’m not sure how many weeks that spelling error goes back, so I have lots of checking to do. I found it last week and it’s “on the list”. 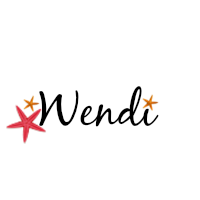 Thanks so much for your good humored note & visiting my blog. Please come back and feel free to let me know how much you enjoy my projects as well as where my brain jumped right over obvious mis-spells! This is just so darn smart and the finish is gorgeous! These are fabulous! Thank you for sharing with us at the Brag About It Link Party! Hi, Wendi ~ I love this project! Such a huge impact! I’m going through my rooms in my mind, trying to figure out where I’m going to put a set of shutters of my own. :0) Thanks for the inspiration! Have a fabulous week! Thank you so much Tiffany. The shutters changed the room dramatically. I wanted an old world feel and they finished the look. Have fun building a set of your own and please share a pic on my Facebook page @H2OBungalow when you do! These shutters look so great! I wish I had a window with enough wall space around so I could make some too! Great job. 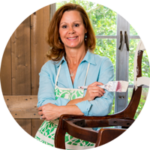 I’d like to invite you to share some of your posts at my Inspiration Thursday link party on my blog this week. I hope to see you there! What a great idea! I love this look. They truly do look amazing Wendi. I look forward to featuring the shutters on Shabbilicious Friday tomorrow. Kerryanne! Yay! Thank you so much! I love your party and totally enjoy all the talented entries…thanks again for featuring mine! Thank you for visiting and hosting such a lovely party! Those look amazing Wendi!! 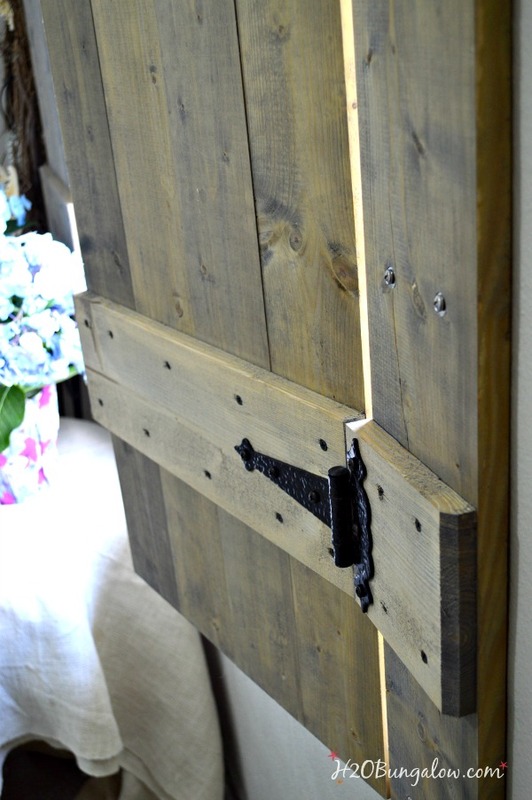 And that weathered wood finish is the perfect touch! Wendi, Your shutters are beautiful on your window. I just love how they look. Great job!!! Thank you Liz… This wasone of those projects that was on the “I want to do” list for so long. It was worth the wait and I’m loving all the sun they let in! Love your shutters Wendi. You and your Dad did a fabulous job and great tutorial too BTW! I love the old world feel you are incorporating into your new office. The shutters work so cohesively with the style of your window. Thanks Marie!! I can’t wait to share more of the makeover. It’s been so much fun re-imagining my work space. Especially because I can make it as creative as I want! Wendi what an amazing job! I feel like this would instantly transport my house to the Provence region in France. When I studied abroad there I had these in my room and would have the best sleep when I closed them. No light would get in at all. I miss it! I love your shutters! What kind of stain did I you use on the wood? 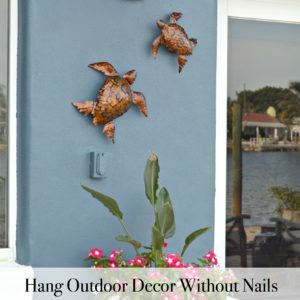 Thank you Linda:) I used driftwood, which is a waterbased stain that darkens overnight. It comes in a powder and you mix it with water. I’ll put a link in the post for it. I loved how it came out and I didn’t have to use regular stain which is always messy.